Despite reports that the dual-screened YotaPhone 2 would take the stage with T-Mobile, the manufacturer has confirmed that the second generation device will indeed come to North America by way of Indiegogo. YotaPhone 2 is distinct for its dual-display set-up. A 5-inch full HD AMOLED panel in the front, and a 4.7-inch e-ink display on the back. With battery advances barely creeping along (if at all), the e-ink display gives the YotaPhone 2 an ace up its sleeve, as such displays are highly power efficient. Yota says you could get up to three days’ use if you utilize only the rear display. Not a bad performance from a 2,500mAh power cell. Under the hood, the YotaPhone 2 will be powered by Qualcomm’s venerable quad-core Snapdragon 801 CPU, singing along at 2.2GHz. The connectivity and capacity features are present, with few surprises – LTE (for AT&T and T-Mobile), NFC, Bluetooth 4.0, the whole Wi-Fi alphabet, 2GB of RAM, 32GB of non-expandable storage, and a nano-SIM slot. Android 4.4.4 KitKat is probably what the device will ship with, but Yota is working to either ship with Android 5.0, or make the upgrade available shortly after the devices begin reaching customers. Yota is also updating its API for developers that want to enable their apps to work smoothly with the device’s e-ink display. What happened to carrier or retail plans? Yota says it plans to expand availability through retailers like Best Buy. 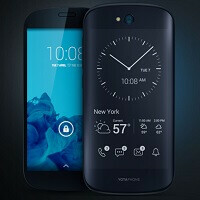 For the near term, the YotaPhone will be available only in black, while a white option will be offered later in the summer. The black faces remain, but a white trim will be added along the sides. The Indiegogo campaign will launch in April, and the YotaPhone 2 will cost $600. Early backers will get as-yet unconfirmed incentives, like a bumper case or perhaps a discount. How are you going to put a case on it?